Starting at 7 a.m. Friday, September 8, crews will begin paving the median area along 32nd Avenue S on the east side of the work zone. To complete paving across the intersection of 32nd Street S from the medians, cross traffic for 32nd Avenue S will be restricted for a short-time. Drivers will be able to access local businesses on the north side of 32nd Street S via 33rd Street S to 30th Avenue S. Access for the south side of 32nd Avenue S will be via 33rd Street S to 35th Avenue S, or by use of 36th Street S to 35th Avenue S.
Project work is anticipated to take 5 – 6 days, weather permitting. 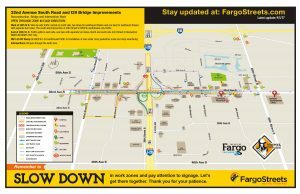 After 32nd Street S is opened to traffic in all directions, 33rd Street S will change to right-in and right-out traffic movements to continue paving operations through the stretch. In the upcoming weeks, drivers can anticipate the south side 39th Street S intersection to open to both directions of traffic and additional driving lanes opening on the west side of the project. West of 39th Street S to west end: Traffic carried on outside driving lanes, two lanes for westbound drivers and one lane for eastbound drivers, with separate turning lanes in each direction. The 39th Street S south side intersection opens to southbound drivers only. East of 36th Street S to east end: Traffic carried on outside driving lanes, one lane in each direction with separate turn lanes. The 32nd Street S and 32nd Avenue S north and south side intersections are right-in and right-out only. I-29 Bridge: traffic carried on the south side, one lane of side-by-side traffic with a turn lane to access the interstate open in each direction. 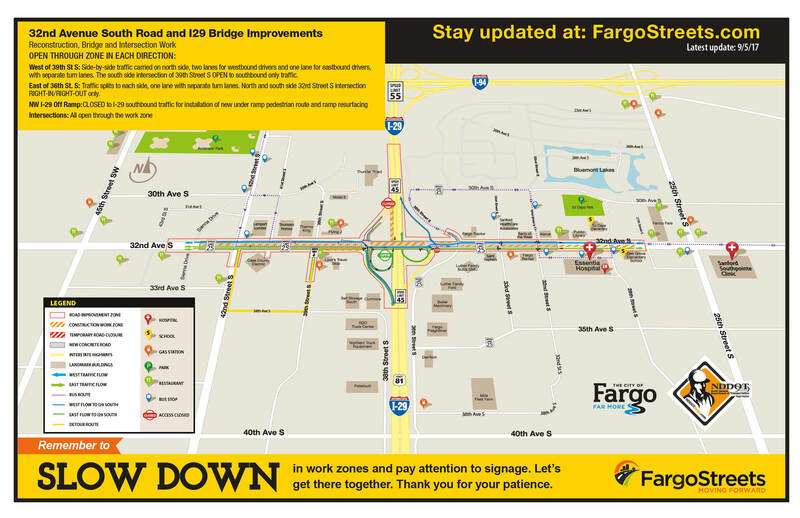 Five of the six I-29 ramps on 32nd Ave S are open for traffic. SW I-29 Loop Ramp: Now OPEN to I-29 southbound traffic onto 32nd Ave S access to both east and west moving traffic. As a reminder, the speed limit on 32nd Avenue S is reduced to 25 mph and 45 mph on I-29. Crews are working near oncoming traffic in parts of the work zone, so drivers are asked to slow down, eliminate distractions and pay attention to signage.